Asparagus is an alkaline food, which is rich in protein but low in calories and carbohydrates. It is an excellent source of potassium, folic acid, vitamins A, C and K, and traces of vitamin B complex. Asparagus has an abundance of an amino acid called asparagines, which helps to cleanse the body of waste material. As a result, some people pass out smelly urine after eating asparagus. Don’t worry if this happens to you. Just be glad that your kidney is functioning, as it should. Asparagus is one of the few vegetables that are highly dense in healthful nutrients that help many ailments. Cancer: Asparagus is a prime source of anti-oxidant and glutathione that can help prevent cancer. 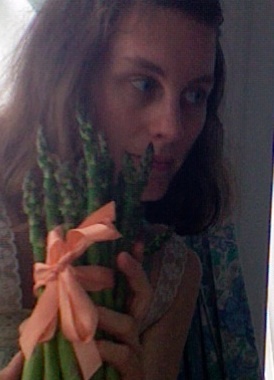 PMS symptoms: The diuretic effect of asparagus juice helps relieve premenstrual swelling and bloating. The magnesium in this wonder juice also helps relieve irritability, fatigue, depression, etc. Please visit the web site for more benefits on Asparagus. Asparagus *recipes are listed on blog for ways to prepare and enjoy asparagus.